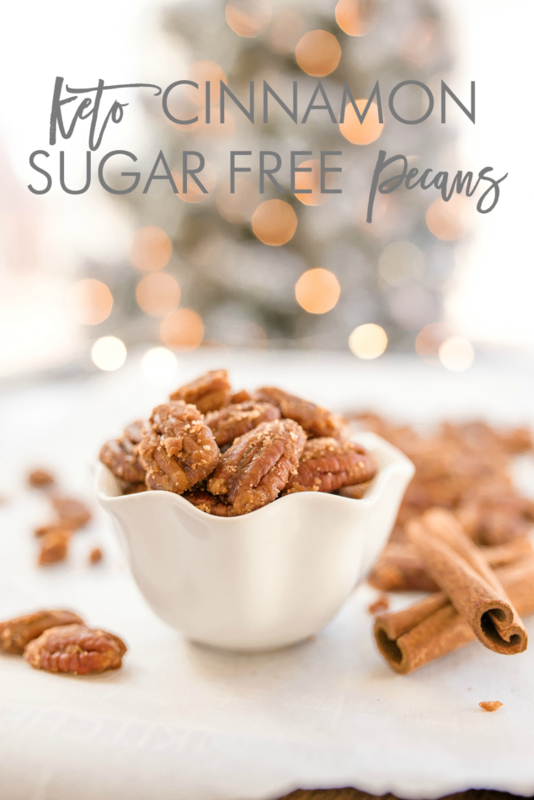 If you’re on a ketogenic diet, watching your calories and carbs, or just looking for a sweet treat without the sugar, then this recipe for Keto Cinnamon Sugar (free) Pecans is for you! Tastes so good your family won’t even know it’s sugar free. I have been eating a keto diet for almost one year now and feel fantastic! I’m down 30 pounds, nearly seasonal allergy free, have more energy, and my skin hasn’t looked this clear since before hitting puberty. Over Thanksgiving I decided to eat “normally” and I really regretted it. My seasonal allergies flared back up and I felt just horrible. It took me over a week to get back on track with keto and feeling good once again. Admittedly this time of year is harder to stay keto, but not impossible and it doesn’t have to mean depriving yourself of sweet treats. Lightly toast your pecans. Place half a tablespoon of butter or so in a saucepan and melt over medium heat. 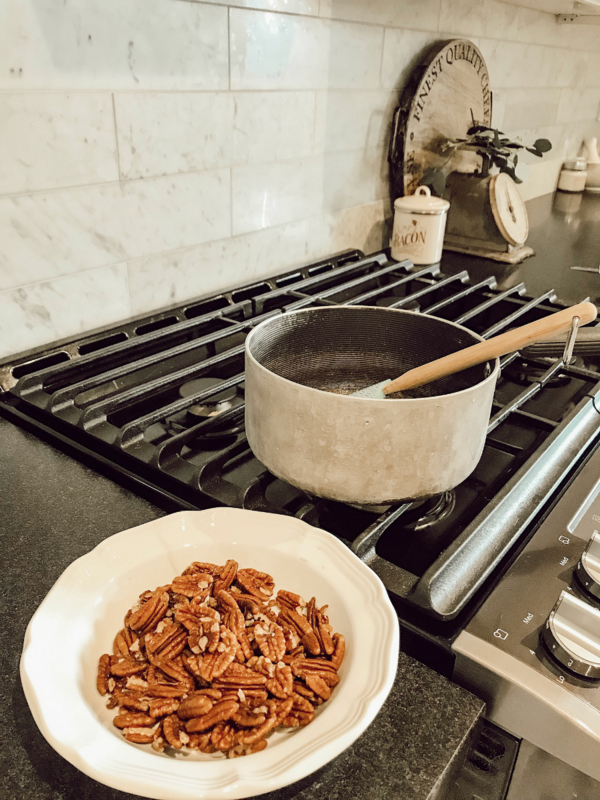 Place pecans in pan and constantly stir until nuts are fragrant and toasty smelling. Don’t overdo it or nuts will burn. Remove nuts from heat and place in bowl until needed. In saucepan mix together 1 Tablespoon butter, cinnamon, salt, maple flavoring, vanilla, and Swerve. Stir constantly over medium high to high heat until mixture becomes liquid and golden with no crystals. 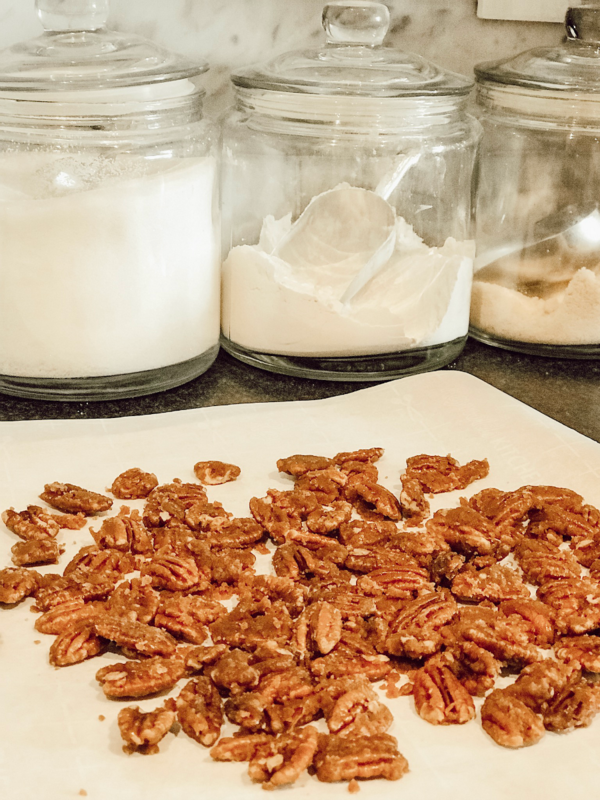 Remove from heat and stir in pecans until nuts are completely covered in mixture. 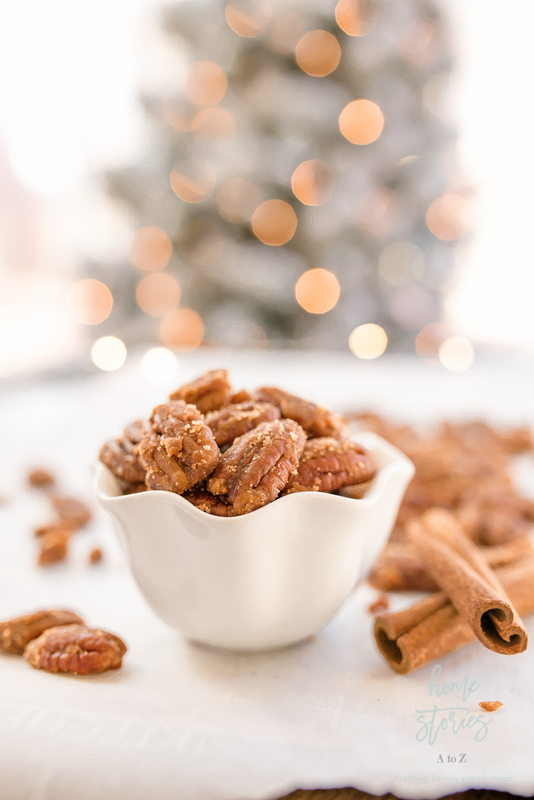 Pour pecans onto parchment-lined cookie sheet, separate nuts so they aren’t touching, and allow to cool completely before storing. 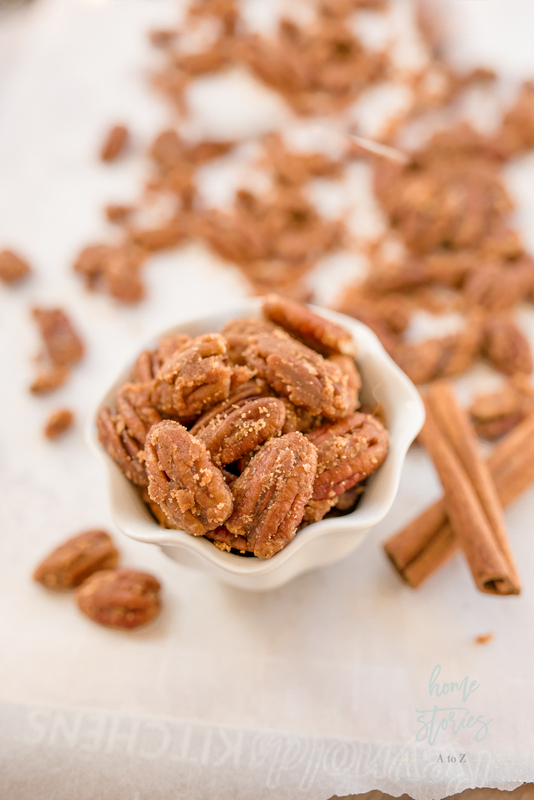 When my husband and kids arrived home to a house smelling of toasted pecans covered in butter and cinnamon, they weren’t able to resist! They ate a bunch before I could tell them that those were supposed be MY special keto pecans. My husband didn’t believe me. He said, “When I was eating them I wondered if you’d made them for yourself, but after tasting them I thought there was no way they could be keto!” Yes, they are that good! 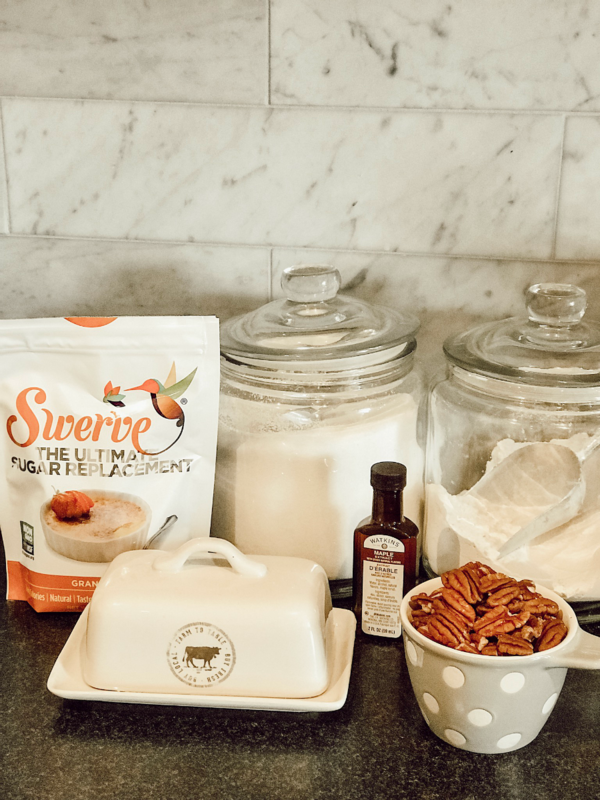 If you haven’t tried Swerve before, it is made with the sweetener erythritol which has an odd cooling sensation when you eat it. I can only tolerate sugar alcohols in small doses without stomach upset so this treat is perfect! The addition of the maple flavoring and vanilla gives the nuts a yummy brown sugar taste that everyone loved. I hope you enjoy them too! Feel free to pin for later. In case you’d like a printable version of the recipe, here is one for you below. Simply click on the work “Print” in the top right-hand corner to bring up a printable version of the recipe. For more yummy Christmas treat ideas, check out these delicious recipes from my blog friends! These look amazing and I love that they are keto! What an amazing snack for the holidays, Beth! Merry Christmas! Thanks for sharing, I can’t wait to try this one! Would really like for you to share more of your keto recipes if possible. We’ve been eating keto for about 2 years and am always looking for new recipes to try.